Read this first Samsung updates, Android updates, security updates, firmware updates – they are the topic of debate for many smartphone enthusiasts. But when do they arrive? How often can you install them? And how do you know when your Galaxy has one waiting? Here at SamMobile, we live and breathe firmware updates big and small. To make life easier for you, dear Galaxy user, we track updates so you do not have to. To make the latest update information available to user who do not want to dive head-first into technicalities, we are publishing our weekly update magazine. Head straight down to check the latest issue, where you’ll find easily accessible update information about your device. Here, we’ll shed a little light on one of the most misunderstood topics in the Galaxy. For those of you not so familiar with all technicalities of your Galaxy device, we’ll give you a quick run-down of what, in fact, is an update. Unlike the actual hardware of your phone, the software is not static. Regularly, your Galaxy device will receive new bits of software – yes: updates – that improve its security, according to the latest research. Less often, your Galaxy will receive a large update to the entire Android operating system (OS). This happens about once a year, during the two years after your device’s initial release (which is likely different from the date you purchased it). This is the two-year support period often mentioned in the media. However, despite popular myths about lack of support, Samsung has gradually been expanding the support period for security updates. Even in 2017, older devices like the Galaxy S4 (from 2013) and Galaxy S5 (from 2014) have received security updates for a period of three years, or longer. So, roughly speaking, you will get two different types of updates on your Galaxy phone or tablet: security updates, that arrive roughly every month, or at latest every quarter, and OS-updates that arrive about once every year. How do I know when an update is available? When a new update becomes available for your device, you will automatically be notified. This usually does not happen on all devices the moment the new software goes live on Samsung’s servers. Aside from rare cases, most updates are not critical to your phone’s functioning or security. In our experience, you will always receive an update within one to two weeks after it first became available. That is, of course, if you do nothing and simply wait for your phone to update itself. Can I check for updates myself? For most users, simply using their device until the update announces itself is completely fine. However, sometimes you will want to trigger the update manually. Before you go on holiday, camping, or simply when you won’t have a good internet connection for the rest of the day. In this case, you can have your device search for an update manually. The exact procedure can differ slightly, depending on which Galaxy you own. Generally, you can find the manual update option, by going into your ‘Settings’ menu. There, you will either find the option ‘Software-update’ in the main menu, or you first must tap ‘About device’. Either way, you now see an option ‘Download updates manually’. Tap this, and your phone will communicate with Samsung’s servers, and download the new software if it is available. 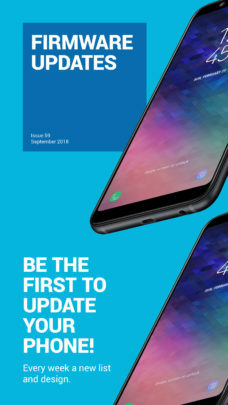 Samsung Galaxy Updates Magazine by SamMobile Of course, the easiest way to keep yourself informed about any updates, is to bookmark this very page. You can do so by hitting CTR+D. Below, you will find a neat overview with all updates that became available in the past few days. Just pick the latest issue of our magazine, open it, and click on the name of your Galaxy device to see a list of countries and carrier. If your country (and carrier) is listed, your device will start updating soon. Or, as we explained, you can start the update process manually as described above.